Schroon Lake, Clifford J. Rocque Sr., 81 passed away suddenly Tuesday September 18, 2018 at his home. Cliff was born in Waterford, NY August 10, 1937 the son of the late Ernest Pierre and Edith (Leddick) Rocque. He was predeceased by his brothers, Chuck, Ray, Ernie and Leo, his sisters Pat, Mary and Helen. Cliff graduated from CCHS in 1955 and in November of that year he enlisted in the US Navy. He proudly served from 1955-1958 and was honorably discharged to the National Guard until 1962. Cliff was a devoted Husband, Father, Papa, Brother and Uncle and adored his family above all. Cliff was the 'go to' guy for a good joke, poetry or an uplifting conversation. He was an avid sportsman and his hobbies included playing the organ, guitar, hunting, fishing, golfing and cooking, he was a self-proclaimed 'foodie'. His most recent endeavor was learning to speak Spanish. He also enjoyed horse racing and playing poker with his family. 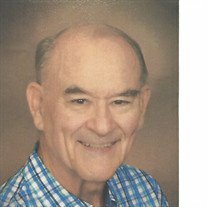 He was a long- time communicant, lector and choir member of Our Lady of Lourdes Catholic Church in Schroon Lake. Cliff and his wife enjoyed going to their home in Florida each winter, where he was always the hit of the Bingo hall in their active community, as he frequently provided delicious treats to all his friends. Cliff retired as an Account Executive after 20 years at AT&T and began a new career in advertising until he retired to build his own home in Schroon Lake. Cliff is survived by his loving and devoted wife of 62 years, Marge (O'Neil) Rocque of Schroon Lake, his 8 children, Meg Rooney, Therese (Bruce) Winters, Colleen (Steve) Dewey, Eileen (Pat) Dewey, Cliff Jr. (Laurie) Rocque, Kathy (Peter) Sweeter, Bill (Gina) Rocque and Jennifer Rocque, 21 grandchildren and 16 great-grandchildren and many nieces and nephews. He is also survived by his sisters, Monica and Fran, sisters-in-law, Kate and Anne and brothers-in-law, Bill and Tom. A funeral mass will be offered Monday September 24, 2018 at 11:00 AM at Our Lady of Lourdes Catholic Church in Schroon Lake. Internment will take place on Friday September 28, 2018 at the Gerald B.H. Solomon Saratoga National Cemetery in Schuylerville, NY. Calling hours will be held on Sunday September 23, 2018 from 3:00 PM until 5:00 PM at the Edward L. Kelly Funeral Home 1019 US Rt. 9, Schroon Lake, NY. In lieu of flowers, memorial contributions may be made to the Schroon Lake EMS, Schroon Lake, NY 12870.